Five years after the Michael Schumacher accident his rescuer has spoken. Five years after Michael Schumacher's devastating ski accident, his rescuer has spoken. In 2013, German race car legend Michael Schumacher was skiing in the French alps when disaster struck. The racing driver, who raced in Formula One for Jordan Grand Prix, had built a career breaking Formula One racing records. But when he was skiing off piste with his 14-year-old son Mick, descending the Combe de Saulire at Meribel ski resort, he fell and hit his head on a rock. Despite wearing a ski helmet and being an experienced skier, he spent the next six months in a medically induced coma, with the head injuries rendering him wheelchair-bound and unable to speak. But five years after the 49-year-old’s accident, his rescuer Stephane Bozon, a mountain cop, has spoken. Bozon said that given the location of the injury, the retrieval was difficult. “The first responders said that because the accident site was next to the slope, it was difficult for them to transport him carefully and cautiously,” he told German news outlet FOCUS. “It was clear that it was very serious, otherwise we would not have used the helicopter. 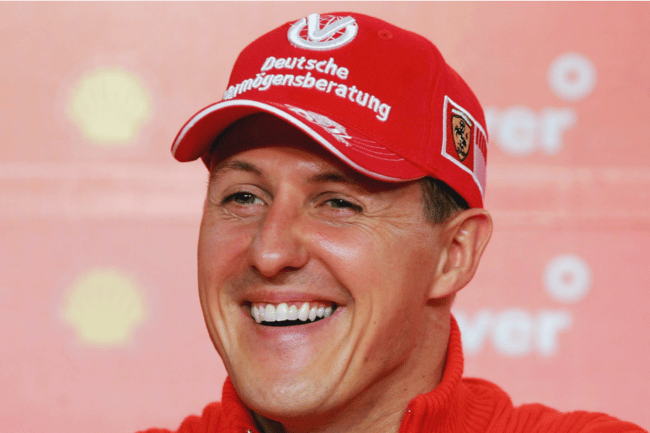 Mr Schumacher was lucky (to survive),” he added. He explained the nature of the stone Schumacher had struck. “I saw the stone Schumacher encountered with his skis and the stone he hit with his head… It had snowed so little in the days before that the stones were slightly covered with snow, but only with a very thin blanket of snow. He could not see the stone,” he said. “But if it had snowed more, Schumacher would probably just have glided over the first stone,” he added. Bozon emphasised that skiing off piste is at your own risk. “The operator of the ski resort is not at fault. Because if you go off the slopes, it is at your own risk,” he said. As reported by The Sun a close friend of Schumacher’s now 19-year-old son Mick opened up about the impact it’s had on the Schumacher family last month. Nicklas Nielsen told Danish newspaper BT Mick is “completely closed” about his 49-year-old father’s condition. “Mick does not say he is sad about his father. He just said sometimes that it is hard,” said Nielsen. Mick, who is following in his father’s footsteps as a professional racing driver, previously told the BBC his father “had a huge influence” on his career.